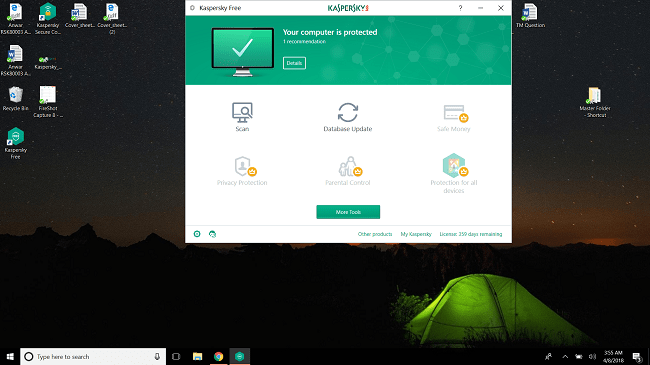 Kaspersky or Avast, which antivirus software is a better option in 2019? Read this comprehensive, data-driven guide to make a smart decision. In the modern world, a part of our life is stored on our devices (especially computers and mobile phones), so – needless to say — we need to take their security seriously. We need to take extra measures to make sure our sensitive data and personal information are safe from the bad guys of the internet (a.k.a. the “hackers”). With time, hackers have become incredibly smart and have developed many new (and clever) ways to sneak into your computer. Even if you aren’t visiting spammy websites, downloading files from shady sources, clicking malicious links, you can still get infected by “malware” — a broad term used to refer viruses, spyware, ransomware, worms, and other online threats. So, it’s imperative that you use an antivirus software program to safeguard yourself against a variety of malware threats that are out there in the wild. In this comprehensive guide, you’ll see a detailed comparison between the security products offered by Kaspersky and Avast — two top-notch security companies in the antivirus realm. First, let’s see the different products Kaspersky and Avast offer. 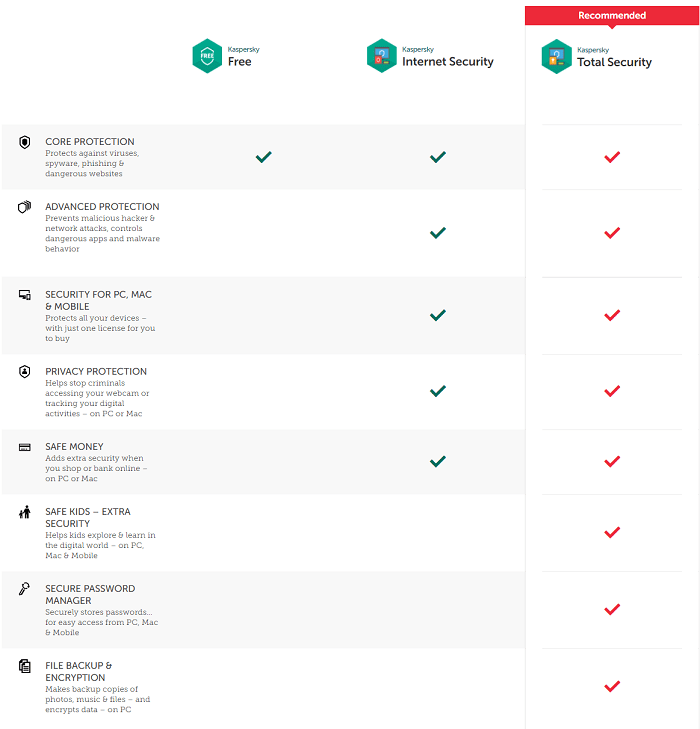 If you’re in a hurry and only want to see the summary of this detailed Kaspersky vs. Avast comparison, you can look at the infographic below that neatly summarizes the whole comparison. Avast offers more security-related features and extra utility tools in its security suites than Kaspersky. Independent tests prove that both software provide excellent protection against both widespread and zero-day malware, but Kaspersky is slightly better than Avast in terms of the impact on system performance. What’s Included in Kaspersky Antivirus Suites? Following the footsteps of its competitors, Kaspersky released its freeware, Kaspersky Free, in July last year. The entry-level product may look bare-bones but if you take a closer look, you’ll know it still offers more in terms of features and protection than its competitors’ free products. It provides essential malware protection, checks emails for malicious content, protects against phishing attacks, and also blocks dangerous websites and downloads. Also, it automatically scans connected USB drives for malware. Another useful feature in the freeware is an on-screen keyword; it helps protect your sensitive information, such as banking details, from keyloggers. If your computer is so riddled with malware that it can’t run antivirus software, you can use Kaspersky’s free Rescue Disk to reset your computer. If security is your top priority, and you want to enjoy premium security-related features and advanced malware protection, you must select any of the Kaspersky’s premium suites. Next level up is Kaspersky Anti-Virus. In that, you’ll get all the features jammed into the company’s free offering, along with ransomware protection, a game mode to minimize interruptions, and a vulnerability scan option (checks for outdated software and other vulnerabilities in your operating system). Another level up is Kaspersky Internet Security, the company’s most popular plan. It offers a great array of features, including a two-way firewall (actively monitors network traffic and prevents attacks), a SAFE MONEY hardened browser for secure shopping/banking experience, and also helps you remove potentially unwanted programs and web trackers. Additionally, webcam and microphone protection and a basic-level parental control filter (enables you to block your kids from seeing objectionable content and manage their social media usage) are also included in the plan. Kaspersky Total Security is the company’s full-blown suite, boasting nearly every feature you could think of. Along with all the features that are part of the ‘internet security’ plan, you get an unlimited password manager (securely stores all your passwords at one place), an automatic backup software with 2GB of online space from Dropbox, and file encryption and shredding capabilities. Note: Both Internet Security and Total Security suites also allow you to protect all your devices (PC, Mac, and mobile) with a single subscription. A limited free VPN with a maximum data limit of 200MB per day is included in all Kaspersky’s security suites, including the freeware. Interestingly, even the top-notch suites have the same data usage limits. Now, let’s talk about what Kaspersky offers for macOS users. Much like its Windows-only freeware, Kaspersky offers a free antivirus solution for Mac users too, called Virus Scanner for Mac. It includes an on-demand virus scanner (checks for viruses, spyware, adware, Trojan horses, and other forms of malware) and also provides detailed reporting on any threats it catches. Also, the product automatically updates itself so you don’t have to worry about updating it every now and then. The premium version of the solution, Virus Scanner Pro for Mac, adds a download scanner (automatically scans all the files in your ‘downloads’ folder for malware) and also gives you step-by-step instructions on how to remove various malware. If you want to get proactive protection and advanced security-related features, you should upgrade to Kaspersky Internet Security or Kaspersky Total Security – both of which are compatible with Mac platform, too. What’s Included in Avast Antivirus Suites? First, let’s look the Avast’s security suites for Windows users. Avast’s free security solution, called Avast Free Antivirus, is one of the most feature-rich free security solution available in the market. It not only boasts decent level of malware protection, but also includes several security-related tools and utilities that most companies only offer in their premium suites, including an unlimited password vault, a WiFi inspector (checks for vulnerabilities in your network), and a limited software updater (tells you about other software that needs updating). A game mode feature for uninterrupted experience and a rescue disk utility are also available in the freeware. If you want to run Avast alongside any other antivirus application, it can happily go into the passive mode. The two browser plugins that Avast offers are Online Security and SafePrice. The former steers you clear of dangerous websites and also stops phishing attacks, while the latter is price comparison and coupon finder tool that could help you find the best deals while shopping online. Next up is Avast Antivirus Pro. It includes everything that comes as part of the free version plus Sandbox technology (lets you test suspicious files in a virtual environment so don’t damage your computer), a Real Site feature (prevents hackers from redirecting you to fake websites to steal your sensitive details), and premium customer support. Another level up is Avast Internet Security, the company’s most popular suite. It adds an advanced firewall, an anti-spam filter (blocks junk and phishing emails), and extra protection against ransomware. 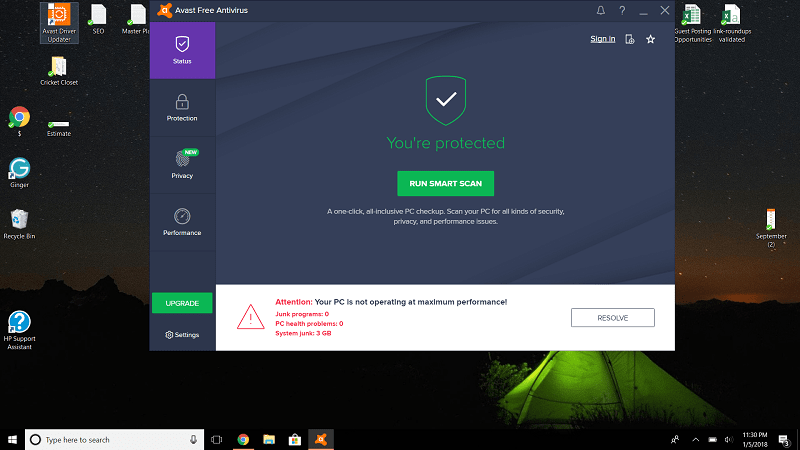 Avast Premier includes everything in the ‘Internet Security’ suite plus a file shredder, an automatic software updater, and webcam protection. Avast Ultimate is the company’s top-of-the-line security suite, boasting almost all the features that you could name. It includes a cleanup utility, an unlimited VPN, and an enhanced version of Avast’s password manager, along with every feature that is jammed into the ‘Premier’ suite. Now, let’s see the Avast’s plans that are compatible with Mac platform. Avast Security is the company’s free offering for macOS users. Besides providing great protection against different kinds of malware threats, it has a WiFi security scanner (checks your network and connected devices for vulnerabilities), a web shield (protects you from online threats), and an email shield (blocks junk/phishing emails). Avast Security Pro adds a useful Wi-Fi intruder alert feature (instantly notifies when someone connects to your network) and also includes protection against ransomware attacks. Kaspersky vs Avast: Which Software Provides Better Malware Protection? It’s part of the antivirus software’s job to provide top-notch protection against both known and unknown of malware threats. Known malware (also referred to as ‘widespread malware’) is the type of malware which is already out there in the wild, and for which digital signatures are already available. Unknown malware (also called zero-day malware) exploits a previously unknown vulnerability and is much more difficult to detect as no previous signatures are available for it. Usually, antivirus programs employ signature-based detection (checking the suspected files against a database of known malware samples) to catch known malware and heuristic monitoring (checking for behavioral attributes of suspected files) to detect unknown malware. When a new malware sample is found, a prompt signature update is sent out to the community to make sure nobody else gets affected by it. Now, let’s see how Kaspersky and Avast performed in the recent independent lab tests conducted by AV-Test and AV-Comparatives – two well-known and respected companies that regularly test various security products on different criteria. In the AV-Test’s most recent evaluations, various products – including Kaspersky and Avast – were put to test against 228 samples of zero-day malware and 4,887 samples of widespread malware in two-round tests conducted in January and February 2018. Note: These tests were conducted on Windows 7 platform. The results weren’t a lot different when the same tests were held on the Windows 10 platform, in November and December 2017, with both software once again receiving a maximum 6-star rating. This time around, however, the results weren’t as flawless as were in the Windows 7 evaluations. Kaspersky’s protection rate against widespread malware was perfect, at 100%, in both months, but its effectiveness against zero-day malware was at 98.9% in November and 100% in December. Other than a slightly lower 99.9% protection against widespread malware in November, Avast’s scores were perfect in evaluations held on Windows 10 platform. 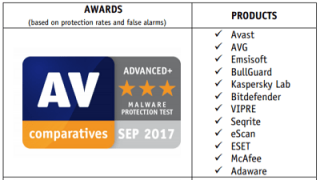 Austrian lab AV-Comparatives conducts two major tests to measure the protection level of various antivirus products: Real World Protection Test and Malware Protection Test. The former aims to rigorously challenge the participating products against ‘real-world’ conditions (as experienced by users) with their default settings in place, while the latter assesses the effectiveness of the security software’s on-demand/on-access scanning engines and behavioral detection capabilities. AV-Comparatives’ most recent Real-World Protection Test report covered average results of the tests conducted consecutively over a period of five months, from July to November 2017). Both Kaspersky and Avast received their highest accolade — which is the “ADVANCED +” award — courtesy of their near-perfect overall protection rates of 99.7% and 99.6%, respectively. Avast registered 11 false positives (identifying legitimate software as malware) over the course of 5 months, while Kaspersky returned only 2. In the AV-Comparatives’ Malware Protection Test, which most recently took place in September 2017, Avast’s protection rate was 99.99% with 9 false positives, while Kaspersky blocked 99.96% of the threats while returning 10 false alarms. Both software received an “ADVANCED +” award in this test. So, it’s clear that both software provide a near-perfect level of protection against malware, and hence it’s a tie in this category. Kaspersky vs Avast: Which Software Puts Less Impact on System Performance? Since it’s part of antivirus software’s job to shield you from threats in real-time, they have to continuously run in the background to do their job, meaning they consume some percentage of your system resources all the time. It is imperative that an antivirus program shouldn’t just provide great malware protection, but also must not significantly degrade system performance by slowing it down. 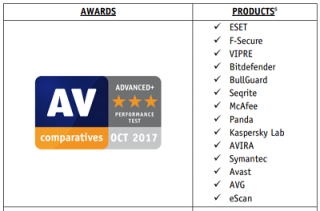 Once against, let’s see how Kaspersky and Avast fared in the independent performance tests conducted by AV-Test and AV-Comparatives. AV-Test’s performance test measured the impact of various antivirus programs in terms of system slowdown; they executed few common computer operations — such as downloading, installing and launching applications, copying files, launching websites — and measured the slowdown each software caused on a standard and a high-end PC. As you can see, Kaspersky received a perfect 6/6 star rating in the ‘protection’ category. Avast, however, was found to be a little more resource-intensive than Kaspersky; it received a slightly lower but still acceptable 5.5/6 star rating from the experts at AV-Test. Note: These tests were conducted on Window 7 platform in January and February 2018. The same tests when held on Windows 10 platform in November and December last year saw both products receive exactly the same results. Kaspersky once against came up with better results than Avast; it received a slightly lower impact score of 8.1 as opposed to the Avast’s 8.9. However, both software were awarded the highest “ADVANCED +” accolade. Kaspersky vs Avast: Which Software Offers a Better User Interface? I think you’ll agree with me when I say everyone prefers a cleaner, easy-to-use interface than a clunky, old-fashioned one. Kaspersky interface looks light, bright, and simple. The homepage has a lot of features and useful links but yet it seems clean and uncluttered. It has six different modules: Scan, Database Update, Safe Money, Privacy Protection, Parental Control, and Protection for all devices. Each one of them contains relevant features and their settings. Clicking the ‘More Tools’ button on the main window takes you to the advanced security features and their settings. At the top, there’s a green banner that changes to red when the software detects an issue that needs your attention. A horizontal menu with links to news, settings, support, and more. If you’re using the free version, you’ll see that most premium features are greyed out, meaning you have to upgrade to a premium plan to get them. Avast interface follows a dark, modern-styled theme and looks neat and well-organized. The first thing you’ll when you open the software is a reassuring “you’re protected” message with a checkmark provided your PC’s health is okay. Just below the message is a button to run a useful ‘smart scan’. Along the left, there’s a vertical menu comprising Status, Protection, Privacy, and Performance tabs. Each tab when clicked elegantly opens relevant modules and their settings in a horizontal roll-out manner. Settings and Upgrade buttons are self-explanatory. If you’re using the freeware, you’ll not have access to the premium features. Also, an unobtrusive banner advising an upgrade is also there at the bottom for free customers. Overall, it can be said that both software offer a user-friendly interface. Kaspersky vs Avast: Which Software is Less Expensive? First, let’s look at the prices of Kaspersky’s security suites. 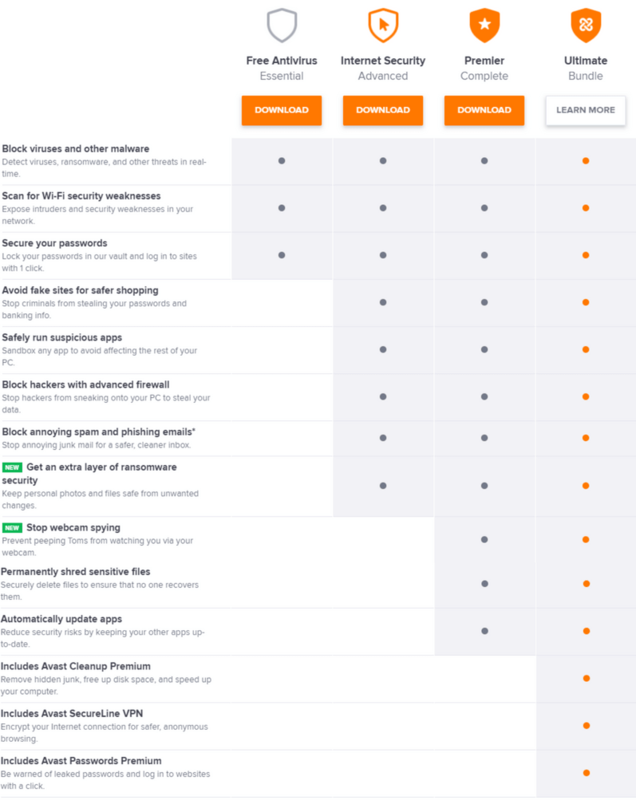 Now, let’s look at the pricing of Avast’s security suites. It’s clear that Kaspersky’s suites are not only less expensive but also cover more devices. Kaspersky vs Avast: Which Software is More Popular? It is not an easy task to decide which of the two software is more popular among the antivirus community as both Kaspersky and Avast claim to have a community of 400 million users. To decide a winner in this category, I will look the independent market share statistics and the total numbers of downloads of each software on CNET’s download.com. According to OPSWAT – a company that releases monthly reports on the market share of leading antivirus companies – Avast leads the table with a dominating 19.64% of the total antivirus market share, followed by ESET (13.31%) and Malwarebytes (12.9%). Kaspersky Lab is last on the list, with only 3.86% of the market share. On download.com – which is the world’s most popular software download portal – Avast has remarkably more overall total downloads than Kaspersky. So, Avast is the clear winner in this category. The world we live in is becoming increasingly complex with every single day, and it makes sense to say that a premium antivirus suite has become more of a requirement rather than a choice.